Addressing Injustices brings together teachers and youth to read, write, make art, and change the world. In 2016, students from Delta Senior Alternative School in Toronto and teacher candidates in the Master’s of Teaching (MT) program at the Ontario Institute for Studies in Education (OISE) at the University of Toronto read the book Beautiful Music for Ugly Children (2012) by Kirstin Cronn-Mills (http://kirstincronn-mills.com), which chronicles the journey of one high school student as he transitions from female to male. 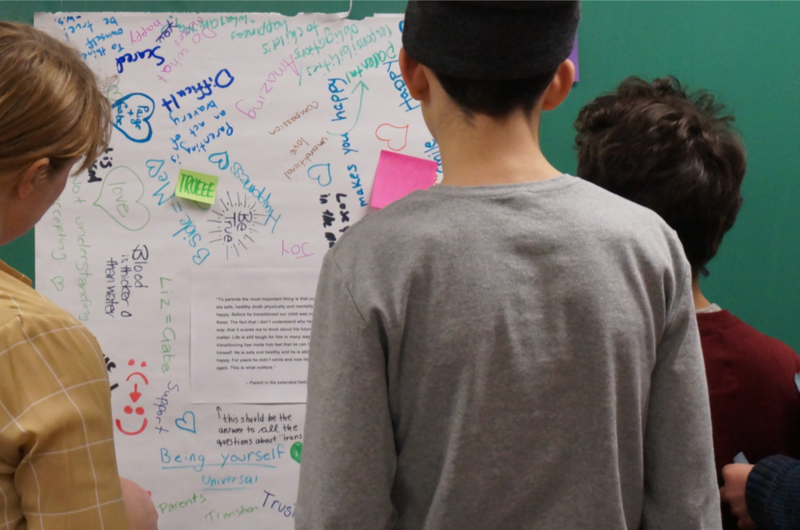 Then, students and teacher candidates worked together to design curriculum and create arts-based projects in response to social issues raised in the book, while co-researching that process. The film, Gender is Like an Ocean tells the story of this research project. We began our investigations together by having conversations about the many kinds of changes those of us in the room had already experienced, such as becoming students, teachers, parents, and siblings. We then asked why certain kinds of transitions are often celebrated, while others are not. Our initial attention towards the personal feelings, perspectives, and histories of those of us in the room became a bridge into the book. We also had a “silent conversation” with each other using an activity called Big Paper, where we responded to passages from the book using sticky notes and sharpies as a way to surface a wide range of thoughts about the ideas within the text. We used found poetry activities to make books and to generate scripts, which we then used as the basis for digital stories that explored our thoughts on gender and change. We also brainstormed and then constructed large creative projects in groups, taking up aspects of the text that were important to us. These projects became a mural, a video game, a YouTube channel, a multimedia installation, and a music video. Classroom teacher, Sarah Evis, who inspires student-driven learning that focuses on a variety social justice issues states, “If I don’t do risky work in my teaching, I’m not interested in teaching. Implicit in our work is that students learn something and then, they can go out and be agents of change as well.” Throughout Gender is Like an Ocean, teacher candidates share some of the struggles they experienced with student-driven learning, as well as how the content of the book impacted their own thinking and values around gender. Students also talk about the importance of doing inquiry-based projects in the classroom and how being involved in this collaborative research project impacted them. Disruptive, inspirational, awe-inspiring, fun, challenging, educational, and life-changing are just a few of the one-word descriptions that students use to express what it meant to work on this research project. Gender is Like an Ocean is a powerful 47-minute documentary that presents a poignant example of how student-driven learning and arts-based inquiry can be incorporated into classrooms. Gender is Like an Ocean had its public premiere at the Ontario Institute for Studies in Education on June 4, 2018. Joining members of the research team for this special event were Beautiful Music author Kirstin Cronn-Mills, who traveled to Toronto from her home in Minnesota, and a panel of six Delta alumni who shared reflections on the project, the film, and their ongoing learning about gender identity and expression. Listen to the Addressing Injustices team chat with Tara Goldstein about the film and their work with youth.